In this brief presentation I will outline connections between Tagore’s work on rural reconstruction and current initiatives that are attempting to relocalise in response to the ecological crisis, caused in particular by climate change and increased scarcity and cost of fossil fuels. To give perfect expression to the One, the Infinite, through the harmony of the many; to the One, the Love, through the sacrifice of self, is the object alike of our individual life and our society. Tagore did not see the human species as a special creation, but as a product of evolution like other creatures. But we are special in having surplus capabilities beyond what we require to meet our basic needs. That surplus makes us creative and also responsible for each other. Tagore wrote proudly of tradition Indian society, ‘of about fifty centuries at least’, which was wealthy: materially, culturally and spiritually, before it was crushed by ‘the Nation of the West driving its tentacles of machinery deep down into the soil’. It was Tagore’s ‘life’s work’ to revive traditional society, strip off its outdated cultural constraints, and bring in the best modern technology, but without ‘the greed of profit’. When he died the world was in crisis but he had not given up his faith in humankind, and he looked ahead to a new dawn. Since the Second World War, the crisis has grown far worse. This crisis is so serious that our only hope, I believe, is to pick up on what Tagore tried to do: revive local communities, build local economies using local resources, being really creative about how we do that, and taking responsibility for each other and the land immediately around our communities – to ‘relocalise’, as we term it now. Many people have realised that relocalisation is our only hope – most of them have never heard of Tagore. The question is, would it help to tell them about his ‘life’s work’, his vision, his faith? I’ll start with a look at the current global crisis. It was that book which took me into a new career involving research and teaching on land degradation. I was shocked at the scale of the damage caused by urban industrial society: deforestation, soil erosion, salinisation, toxification, desertification. Now we would have to add species extinctions to this horror story: a third of the world’s animal species may be gone by 2050, 70% by the end of the century. The solution has to be to reconnect people to the land. 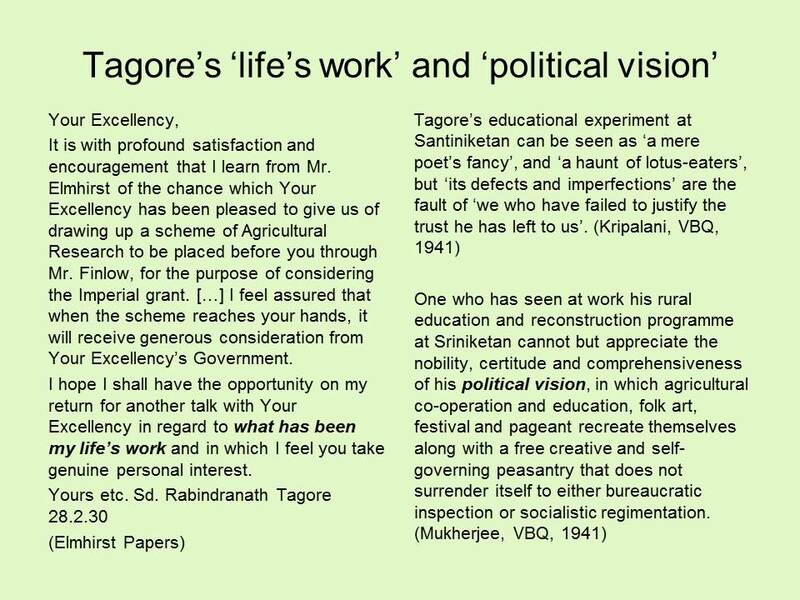 Ten years later, when I got to know about Tagore’s work, I found that he knew about the ‘Robbery of the Soil’ and his solution was reviving traditional rural society. city walls […] leave their mark in the minds of men […] and set up a principle of “divide and rule” in our mental outlook’. These city walls ‘divide nation and nation, knowledge and knowledge, man and nature’. The only environmental concern which worries the general public is Climate Change, due to carbon dioxide from burning fossil fuels accumulating in the atmosphere and acting like a blanket, preventing heat escaping to space. About half the anthropogenic carbon dioxide is absorbed by the oceans, which slows climate change, but dissolved CO2 is highly reactive, and causes acidification of the world’s oceans. 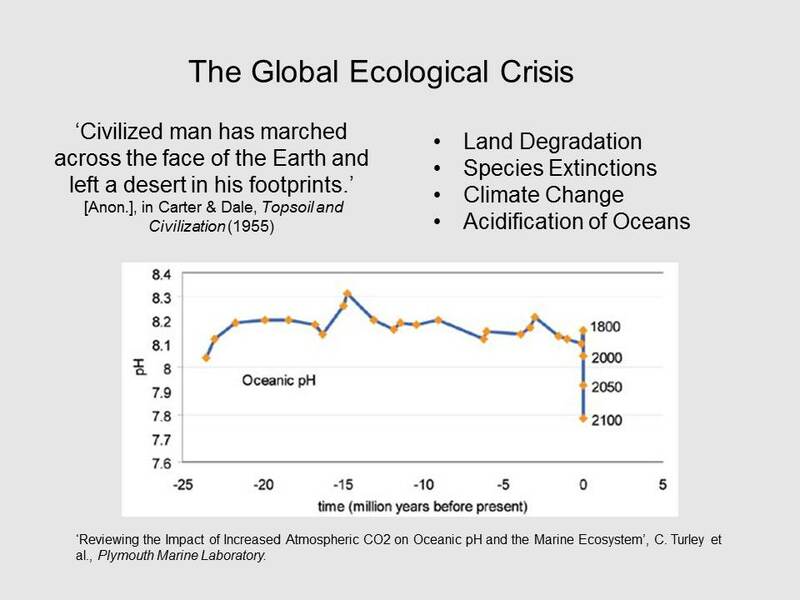 As this graph shows, there was almost no change in oceanic pH for 25 million years, but really rapid changes in acidification from the start of the Industrial Revolution around 1800. Small changes in pH have significant negative effects on marine life and ecosystems. Exposure to such information can be depressing and lead to feelings of helplessness. Perhaps it would be better to empower and inspire people to live their lives differently. Tagore’s interest in relocalisation was social rather than environmental – although he did deplore the ugliness of industry, major ports and big cities. His goal was human happiness: joy, ‘life in its completeness’, cooperation – which is why his life’s work is complementary to the present relocalisation movement driven by ‘doom and gloom’. Tagore and Elmhirst between them span 80 years of relocalisation. We can also include Patrick Geddes, who told Tagore that the problems of East and West were the same. Europe had a race problem too, and Geddes was working to revive French villages. Tagore and Elmhirst established pioneering projects, ambitious in their scope, and they achieved much, albeit on a small scale. But both suffered from a lack of systematic planning and limited funding. There is a fascinating letter from Tagore to Geddes in which Tagore says he doesn’t plan. He doesn’t devise plots for his stories. And with his Santiniketan Institution, he started with ‘one simple idea’ and no training or experience – so he had no plan he could put before the public to win their confidence. Elmhirst’s first act on arriving at Santiniketan to begin work for Tagore was to ‘cable Dorothy for $25,000’: this was Dorothy Straight, millionaire philanthropist, whom Elmhirst married. To set up his rural industries at Dartington, Elmhirst drew on his wife’s personal fortune: ‘digging into Dorothy’s pocket’ as he put it. Although Tagore was suspicious of, and negative about, institutional funding, he appealed for a grant from the Viceroy, Lord Irwin. This is a letter I saw in the Elmhirst archive at Dartington. 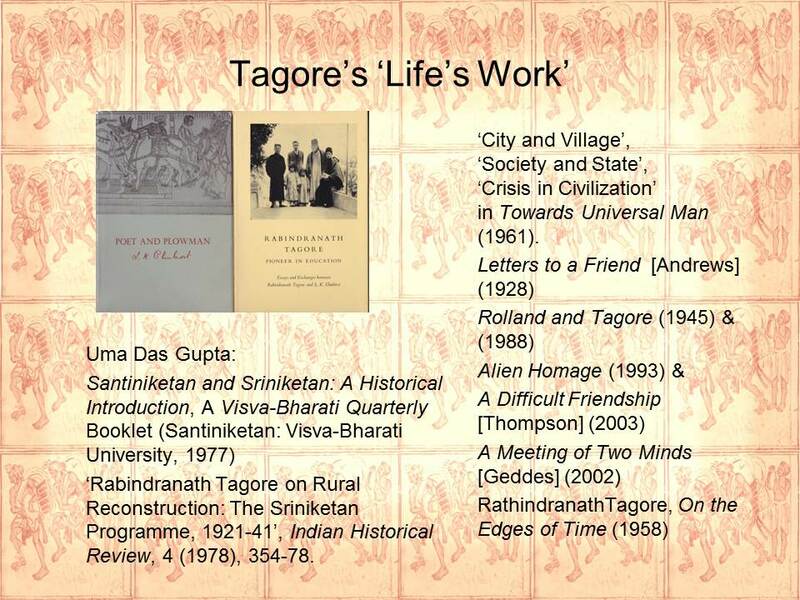 See how Tagore describes his projects as ‘what has been my life’s work’. Money was a major problem, but so were the people he relied on to do all the work, very good people many of them, but they never quite understood his ideals. Kripalani, Tagore’s editor and biographer, says ‘its defects and imperfections’ are the fault of ‘we who failed to justify the trust he has left to us’. One who has seen at work his rural education and reconstruction programme at Sriniketan cannot but appreciate the nobility, certitude and comprehensiveness of his political vision, in which agricultural co-operation and education, folk art, festival and pageant recreate themselves along with a free creative and self-governing peasantry that does not surrender itself to either bureaucratic inspection or socialistic regimentation. Tagore struggled to justify his approach against the rival ‘political vision’. People who might otherwise have been enthusiastic about Tagore’s work, including his own students, friends and colleagues, were distracted by involvement in the nationalist movement. 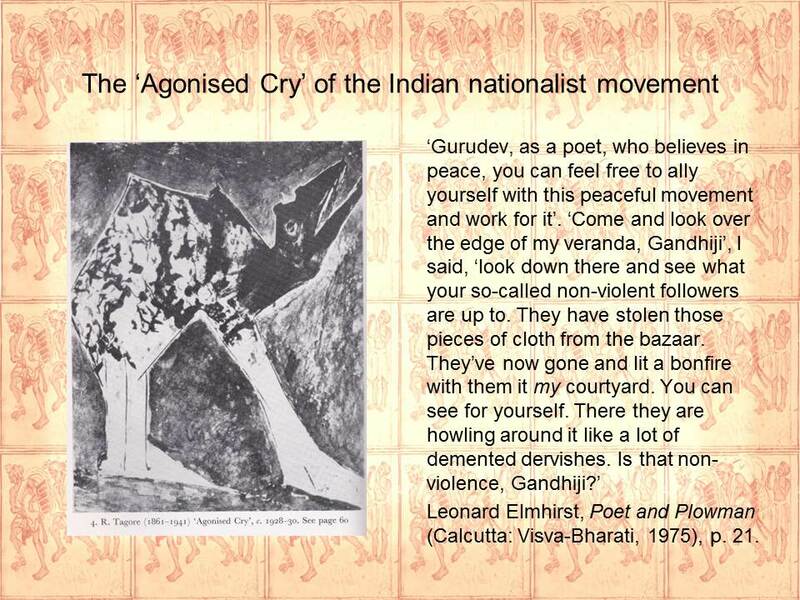 This painting of the ‘Agonised Cry’ of the Indian nationalist movement illustrates Tagore’s view – his priority was to improve conditions for and empower ordinary people, rather than a change of government. There are many examples of Tagore’s disagreements with Gandhi, here over so-called ‘non-violence’. Studying these helps us appreciate the clarity of Tagore’s vision. 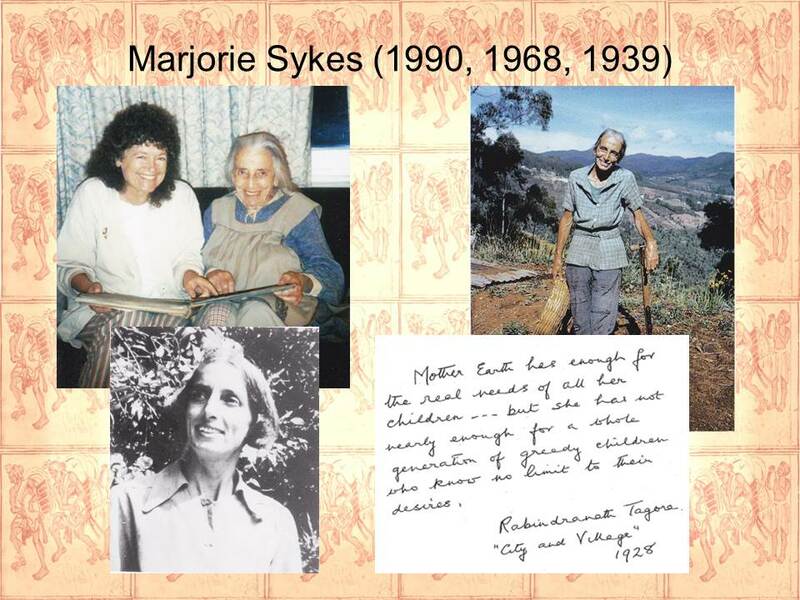 I first heard the name Rabindranath Tagore 20 years ago from Marjorie Sykes. She is showing me her photo album of her farm in South India in the 1960s. She was a teacher at Santiniketan from 1939. She translated Tagore’s My Boyhood Days and other works of his – and wrote a charming biography for her students after his death. Mother Earth has enough for the real needs of all her children … but she has not nearly enough for a whole generation of greedy children who know no limits to their desires. The ‘whole generation of greedy children’ are the human species, Marjorie told me, ‘Rabindranath was a deep ecologist’. That quote was from the essay ‘City and Village’ in Towards Universal Man, and in other essays on the same subject – it’s also in ‘The Robbery of the Soil’ in Elmhirst’s Poet and Plowman. 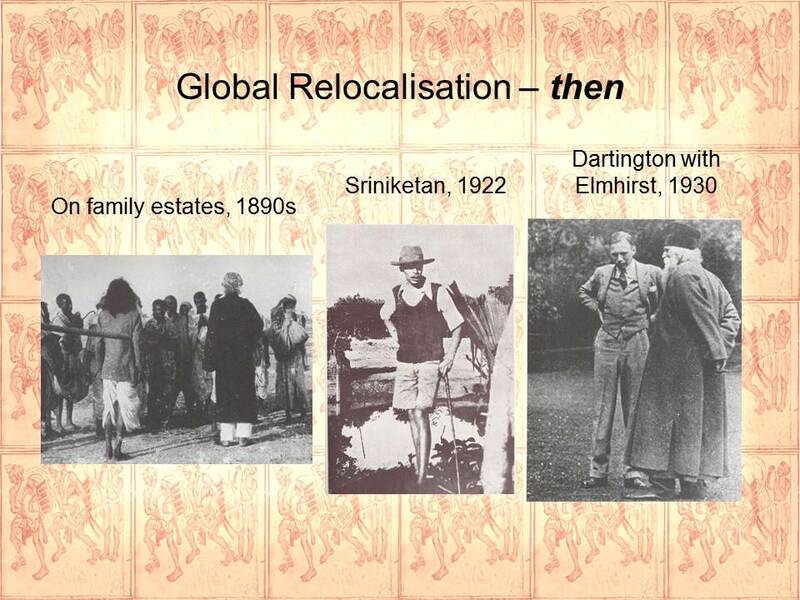 Some years later, I read about Tagore’s rural reconstruction work in the Elmhirst papers in the Dartington Archive. My research and teaching over many years on land degradation and permaculture had brought me independently to the same solution as Tagore: Global Relocalisation. Moving on to the present day. There are many relocalisation initiatives today – perhaps millions worldwide – a lot of them focussed on local food production and localising economies. The three initiatives illustrated here are just those I have personal connections with: Transition, Permaculture and Plants For A Future. 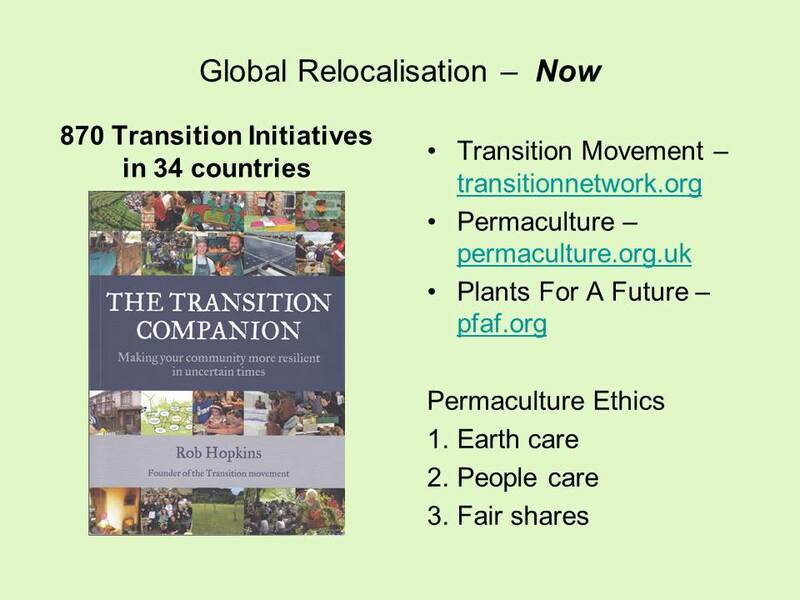 I’ve followed the progress of the Transition Movement from the start because it originated from the Permaculture Movement. I have been a Trustee of the Permaculture Association Britain and am still a Trustee of Plants For A Future, originally a vegan-organics permaculture research project, now a charity which runs a widely respected, free to use, information database on useful plants. I won’t go into details about what the Transition Movement involves. It’s very diverse, you may know quite a lot already, and there is plenty of information on line. The permaculture connection is what links Transition to Tagore’s thought and practice. Permaculture stands for ‘permanent agriculture’ and ‘permanent culture’. It began forty years ago as an approach to designing diverse agricultural systems as alternatives to unsustainable monocultures. It is now about how to design and plan any and every aspect of community life. Importantly, permaculture has an ethical basis, expressed as Earth care; People care and Fair shares. Transition looks very exciting. It’s growing like a virus. But is it growing fast enough, given the scale of the global crisis? It has its critics. I worry about the compromises reflected in the rhetoric. A few years ago, there was an emphasis on being independent of local authorities: the ‘machinery of administration’, in Tagore’s terms. And there is an implicit acceptance of the need to co-exist alongside global capitalism: ‘the greed of profit’ as Tagore called it. Since it started, six years ago, I’ve worried about Transition being driven by concerns about ‘Peak Oil’ and Climate Change – both too easy to deny and make arguments for technical fixes. Also, these Transition Initiatives can look too superficial, fragmentary and local to solve the big problems. People look for solutions at national, international and intergovernmental level – and this provides excuses to duck personal responsibility. I believe – although I’ve not had a chance to test this yet – that knowledge of Tagore’s vision and practice might help deepen people’s understanding of the need for world change. A possible approach to educating world changers about Tagore would have three parts to it, firstly reading about and discussing Tagore’s projects. If you delve into what Tagore – and colleagues – actually did in his rural reconstruction and education projects, you find the scope and the scale is very impressive. This was not just token charity or paternalistic rajah-dharma. There is a lot of important detail about the principles and practice in Elmhirst’s two little books. There is a mass of information in Uma Das Gupta’s two papers from her research in the 1970s in a lost archive of Sriniketan. Tagore’s Bengali essays in English translation and his correspondence with close friends help us understand his philosophy. Secondly, to make the changes needed in society, we need a whole new way of thinking about ourselves. I see a resonance between Tagore’s understanding of human beings and new scientific studies of our species, into the evolution of culture and cognition, how our minds work, how we are less different from other creatures than we once thought. 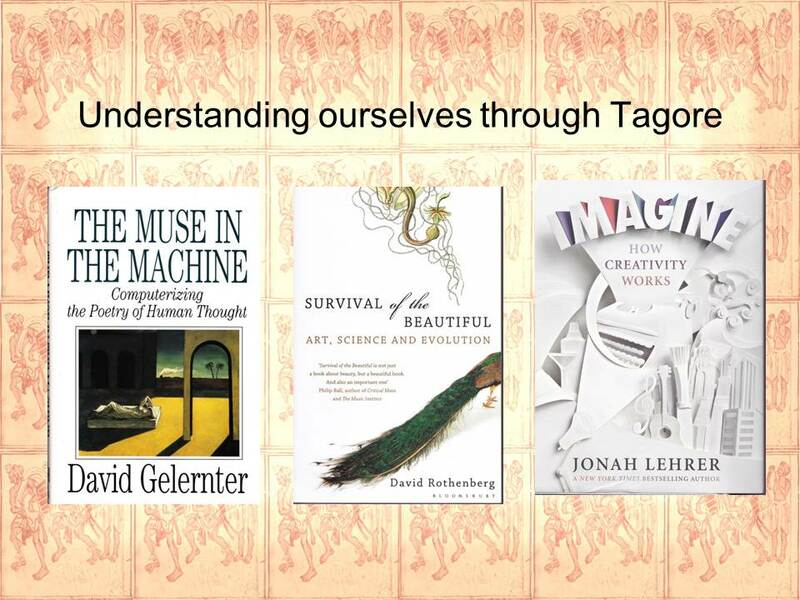 These recent studies resonate with Tagore’s thought in interesting ways. It has often been remarked that he was way ahead of his time. For example, The Muse in the Machine – by a professor of computer science – is about the ‘cognitive spectrum’, and helps us understand how children and poets think differently from scholars. The third part of this ‘education for world changers’ would be to guide students through Tagore’s English essays, e.g., Sadhana (1915), Personality (1917), Narionalism (1917), Creative Unity (1922), The Religion of Man (1931). I say ‘guide through’ the essays because you need to read Tagore in a particular way. He often said he was not a scholar – which seems surprising, given how learned he was – or like false modest, though he wasn’t a modest man. He said he wasn’t a scholar because he chose not to write like a scholar, with defined terms and building logical arguments. He wrote like a poet. You need to sense the rhythms, the repetitions, the particularly intense passages, like arias singing out above the recitative. Some paragraphs benefit by being set out like poetry and read aloud, like this example from Personality. and in this is the significance of spiritual life. to unite with it in harmony. Beauty is the harmony realized in things which are bound by law. Love is the harmony realized in wills which are free. I believe that people read too much of Tagore’s writing too quickly. His essays are very deep; his clear and elegant English is deceptive. So these ‘world change’ students would benefit from cycling round this course again: back to what he did and why; again seek books which resonate with – or challenge – his thought; then again study the essays. This has been a life-changing experience for me, and every time I read this material I reach new insights. Andrews, C.F., ed., Letters to a Friend, (1928), in The English Writings of Rabindranath Tagore, Volume THREE: A Miscellany , ed. by Sisir Kumar Das (New Delhi: Sahitya Akademi, 1996), pp. 219-322. Das Gupta, Uma, ‘Rabindranath Tagore on Rural Reconstruction: The Sriniketan Programme, 1921-41’, Indian Historical Review, 4 (1978), 354-78. Kripalani, K.R., ed., Tagore Birthday Number, Visva-Bharati Quarterly Vol. VII, Parts I & II, May-Oct. 1941. Marsh, Christine, ‘The Tagore Trinities and Holistic World Change’, in Rabindranath Tagore: A Timeless Mind, ed. by Amalendu Biswas, Christine Marsh and Kalyan Kundu (London: Tagore Centre UK, 2011), pp. 191-202. Rahman, Anisur, ‘Roots of action research and self-reliance thinking in Rabindranath Tagore’, Action Research, 4 (2006), 231-45. Tagore, Rabindranath, ‘Society and State’, in Towards Universal Man (London: Asia Publishing House, 1961), pp. 49-66. The Dartington Hall Trust Archive, Papers of Leonard Knight Elmhirst.